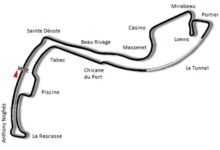 The 1983 Monaco Grand Prix was a Formula One motor race held at Monaco on 15 May 1983. The race, contested over 76 laps, was the fifth race of the 1983 Formula One season and was won by Keke Rosberg, driving a Williams-Ford, with Nelson Piquet second in a Brabham-BMW and Alain Prost third in a Renault. Thirty years later, Rosberg's son Nico won the 2013 race, making them the first father and son to win in the principality. Neither of the McLaren cars qualified. As of the end of the 2018 season, this is the last time a McLaren has failed to qualify for a Grand Prix. This was the only time Niki Lauda failed to qualify in Formula One. Last race for Chico Serra. ^ "1983 Monaco Grand Prix". formula1.com. Archived from the original on 21 October 2014. Retrieved 23 December 2015. ^ Lang, Mike (1992). Grand Prix! Vol 4. Haynes Publishing Group. p. 171. ISBN 0-85429-733-2. ^ Lang, Mike (1992). Grand Prix! Vol 4. Haynes Publishing Group. p. 174. ISBN 0-85429-733-2. ^ a b "Monaco 1983 - Championship • STATS F1". www.statsf1.com. Retrieved 19 March 2019.